Stolen Apples For Karen Blixen, is a three-minute black and white film which begins with a portrait of Karen Blixen taken from a photograph. This is followed by a series of superimpositions featuring two figures crossing a Chinese style bridge in a high wind. Ashden's Walk on Møn (1973) presents another side of Jarman's filmic aesthetic, one more closely tied to his painterly practice. In the earlier film, ghostly images of men walking through a forest to a beach ringed by cliffs are superimposed with brilliant celestial configurations, while the later film presents a seemingly abstract shape that eventually resolves into a large reflective square set on a beach amongst sunbathing nudes. The Art of Mirrors was filmed against the side wall of the Thames-side warehouse that Derek lived in at the time. The music was "found" on the radio in the early 80s. The two seem made for each other. 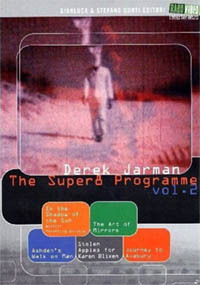 In The Shadow of the Sun (1974-80), was originally put together by Jarman himself in 1974 from re-shot Super-8 material including footage from The Art of Mirrors and Journey to Avebury, amongst several others. The film was eventually blown-up to 35mm and premiered at the 1981 Berlin Film Festival. The focus on ritual, mysticism and obscure alchemical symbolism links it with the work of Anger. However, Jarman's preference for the work of Carl Jung and the "white" magician John Dee, is quite distinct from Anger's invocations of the "black" magician Alistair Crowley.